Tam Son C ommune in Quan Ba District in the northwest province of Ha Giang is endowed with wild scenery and an endless range of stunning limestone mountains. Striking amidst that spot is a place called ‘Double Mountain’, the identical peaks of the limestone mountain. They are shaped like the two breasts of a female in the middle of the field in Quan Ba. This actually is a unique landscape of Tam Son in particular and Dong Van karsts plateau geopark in general. 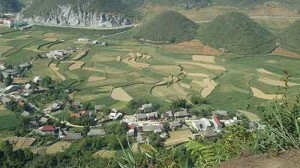 Located about 46 kilometers from Ha Giang City, passing over Bac Sum Pass, tourists will reach Quan Ba Heaven’s Gate. Trekking up to the peak, which is 100 meters high, tourists can admire the panoramic view of Tam Son Town which has an ideal climate all-year round like Sapa Town in the neighboring province of Lao Cai. Especially, tourists can see the plump ‘double mountains’. Double mountain is surrounded by terraced rice fields which change colors for different periods of harvesting: green for the first period, yellow for the harvest and brown for the post-harvesting period when farmers have to plough for the new crop. Nui Doi Mount is associated with the legendary love story of a H’Mong boy and a fairy. The boy had a special talent of playing the flute and his sweet flute melodies soared to heaven. A beautiful fairy heard his music and swooped down to earth to meet him and they fell in love. The couple’s love was hindered by the gods. The fairy was forced to return to heaven after she had a child with the H’Mong man. The fairy cut her breasts and left them on earth to feed her child, which are now the Nui Doi Mountain or Double Mountain. According to legend, thanks to the milk of the fairy, this land has a cool climate and the fruits here taste delicious. Her tears when she said goodbye to her husband and son resulted in Mien River running through limestone forest in the section linking Yen Minh-Quan Ba of Ha Giang stone plateau.